This recipe for Grilled Squid with Chickpeas and Arugula comes from Mark Usewicz, half of the husband-and-wife team behind Brooklyn’s very first community-supported fishery, Mermaid’s Garden. If you don’t have a grill, there’s a sauté option, too. 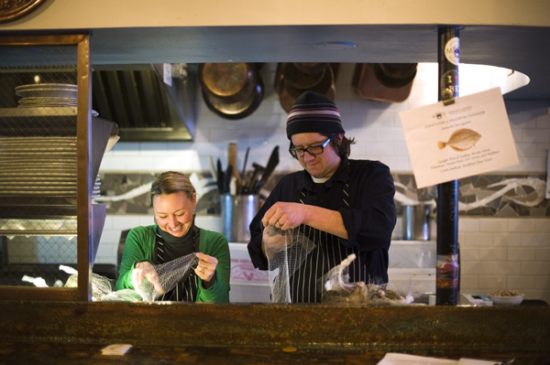 Mark Usewicz and Bianca Piccillo, the husband-and-wife team behind Brooklyn’s very first community-supported fishery, Mermaid’s Garden (featured here in the current issue of Edible Brooklyn), are winning hearts (and stomachs) with their weekly deliveries of spectacularly fresh seafood. At pickups, the pair shares details about the week’s catch, the inside scoop on trawl methods and recipes for making the most of the fish. Here’s one that Mark shared with us for Grilled Squid with Chickpeas and Arugula. And if you don’t have a grill, there’s a sauté option below. 1. Prepare the squid by slicing down one side of the tubes to open them up. Lightly score the open tubes in a crisscross pattern, being careful nut to slice through the squid. Combine the chopped parsley, lemon zest, garlic and 2 tablespoons oil in a large mixing bowl. Add the squid and mix to combine. 2. Heat a gas grill to high or build a hot fire in a charcoal grill. * Combine the pine nuts, chickpeas, cherry pepper, arugula and scallions in a large bowl. 3. When the grill is hot, season the squid mixture with salt and pepper. Place the tentacles on first (they take a bit longer) and then lay the tubes in a single layer on the grill. Cook for about two minutes, flip and cook for one minute more. Remove the squid from the grill, cut each of the grilled tubes into three smaller pieces. Combine the squid and any juices that may have accumulated with the arugula/chickpea mixture. Season with salt and pepper and dress with lemon juice and olive oil to taste. *Alternatively if you don’t have or want to grill you can sauté the squid. Cut the tubes into thin rings. Heat a heavy pan over high heat and add 2 tablespoons olive oil, add the squid and cook for 2-3 minutes, shaking the pan occasionally. At the very end add the garlic, parsley and lemon zest. Stir to combine and proceed with step 3.